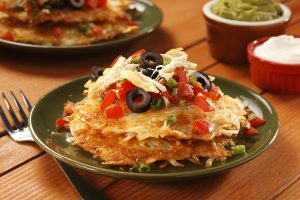 If you’ve ever found yourself with a batch of hash browns that won’t brown, aren’t crispy, fall to pieces, or taste less than savory—you’re in for some great news. 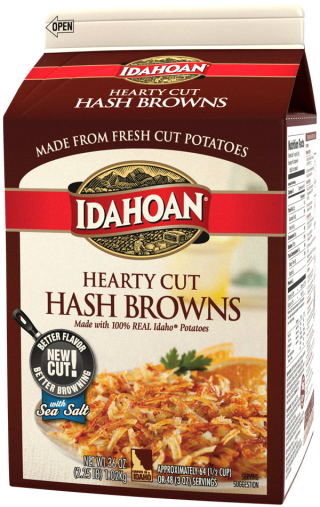 Unlike frozen potatoes and extruded hash browns that never deliver the quality you need, Idahoan® Hearty Cut Hash Browns are 100% real hash brown shreds that always prep exactly the way you want them, and taste as if you made them from scratch. 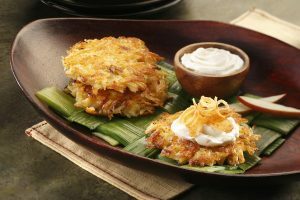 A thicker cut with field-fresh flavor, these shelf-stable hearty hash browns are seasoned with sea salt and cracked black pepper, and are ready when you are—just add water and refresh (10-minute, 30-minute or overnight refresh options). Fill carton to fill line with hot tap water at 150° – 160°F (65° – 70°C). Reclose carton and refrigerate overnight, placing cartons about 1″ apart. Fill carton to fill line with water from hot water dispenser at 180° – 190°F (80° – 90°C). Reclose and let stand at room temperature for 10 minutes. Reclose and let stand at room temperature for 30 minutes. NOTE: When ready to use, drain, transfer to holding pan and fluff. 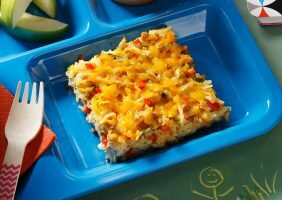 Refreshed hash browns store up to 3 days under proper refrigeration. Place hash browns on a well-oiled grill at 375° – 400°F (190° – 205°C). Grill 3-4 minutes, until golden brown. Grilling required on one side only. Place refreshed hash browns in full size steam table pan. Fold in 1 1/2 cups (350 mL) of melted butter, margarine or oil and layer about an inch thick. Sprinkle with seasoned salt or paprika. Bake at 450°F (235°C) for 8-10 minutes in a convection oven, or 525°F (275°C) for 12-15 minutes in a conventional oven. Pour out a measured volume of dehydrated hash browns per chart below. Add an equal volume of hot tap water. Let stand at room temperature for 30 minutes, then drain. Cook on a well-oiled grill or pan as above. Idaho® potatoes, sea salt, dextrose, vegetable oil (contains one or more of the following: soybean, cottonseed, sunflower, canola), monoglycerides, calcium stearoyl lactylate, sodium acid pyrophosphate (preserve freshness), sodium bisulfite (preserve freshness) and spice.